Chilrden in custody related to cases of illegal entry into the United States rest in one of the cages at a facility in McAllen, Texas. Image courtesy of the U.S. Customs and Border Protection's Rio Grande Valley Sector via The Associated Press. What does it mean that the United States of America is taking children from their parents and detaining them in camps? News of a tent city dedicated to holding children in harsh conditions should evoke alarm, not least because child detention has a long and nasty history. For centuries, children have been used as pawns by governments seeking to control their parents or their leaders. And children have been forcibly relocated in the United States before. Under slavery they were separated from their parents to extort labor and build wealth, while Native American children were taken from their families for re-schooling and to foster the expropriation of land. But the idea of holding whole groups of children in detention on a widespread basis—not as labor in a rapacious economic system or to steal land, but with detention itself as the point—is part of a newer phenomenon. And this more recent form of detention, the version that the Trump administration has embraced for now, sits cleanly within the tradition of concentration camps. While writing a book on camp history, I defined concentration camps as the mass detention of civilians without trial, usually on the basis of race, religion, national origin, citizenship, or political party, rather than anything a given individual has done. By this definition, the new child camp established in Tornillo, Texas, is a concentration camp. While tragic, this is hardly surprising, since the innovation of concentration camps rose in part out of the willingness to detain children. Women and children, together, constituted the overwhelming majority of the populations in the first detention sites publicly referred to as “concentration camps,” which appeared near the turn of the 20th century in Cuba and southern Africa. During a rebellion in Cuba, hundreds of thousands of women and children were driven off their land by Spanish soldiers, who destroyed their homes and crops, forcing them into miserable conditions behind barbed wire beginning in 1896. American reporter Richard Harding Davis visited camps in three Cuban cities, finding detainees—known as reconcentrados—infected with smallpox and yellow fever in squalid temporary housing. He met babies whose “bones showed through as plainly as the rings under a glove.” Well over 100,000 Cuban civilians died as a result of conditions in these camps, a significant percentage of them children. Concentration camps appeared again when the British forced families of rebel Boer fighters into tent cities in brutal conditions in southern Africa. It was understood at the time that the noncombatants were effectively hostages meant to get the men to surrender. A November 1901 letter to The New York Times about the British camps laid out the dynamic: “England, unable to conquer the Boer men, is striking at the women and children.” From the beginning, concentration camps targeted the most vulnerable. Historian Peter Warwick records that in all, more than 27,000 Boer internees died, in the range of double the total number of combat casualties on both sides. Nearly 80 percent of the deaths in the camps were children. Segregated camps for black Africans had even worse conditions and less food, and ended up killing more than 14,000 detainees. In camps in both Cuba and southern Africa, atrocious death rates came not from massacres or gas chambers but from disease and starvation. Yet in these early camps, lethal as they were, most children remained with siblings and their mothers. Later camps would break with that precedent in shocking ways. In the last years of the World War II, Germans took children from non-Jewish foreign parents upon arrival in the regular concentration camp system, the Konzentrationslager, sending them for denationalization and integration into German society. The children of Jewish parents were more often sent to the subset of Nazi death camps dedicated to extermination of Jews as a people; typically, they were murdered on arrival. Jewish twins kept alive to be used in Mengele’s medical experiments. 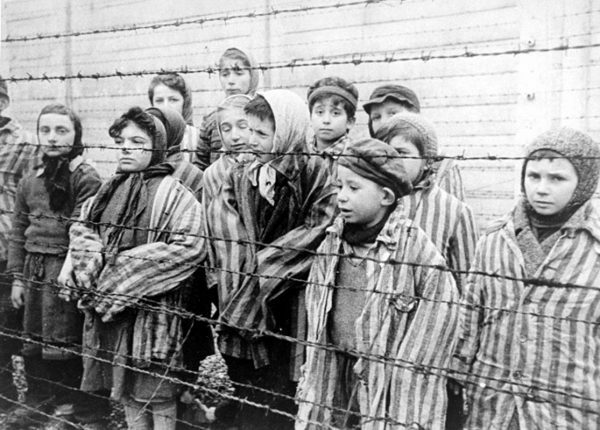 These children were liberated from Auschwitz by the Red Army in January 1945. Photo courtesy of Wikimedia Commons. In the wake of the death of millions and the abomination that Auschwitz and other death camps represent, classifying any other type of detention facility as a concentration camp can now seem obscene. But it is a mistake to avoid the term. The phrase “concentration camp” was used for sites of mass detention of civilians for nearly four decades before the Nazis came to power. Even their gentler incarnations, such as the internment of military-age males during World War I, harmed internees, and helped to rehabilitate and institutionalize the idea of camps, setting the stage for more lethal models. Even after World War II’s end exposed concentration camps’ horrors, the mass detention of children continued and evolved. Between 1976 and 1983, officials of Argentina’s military dictatorship detained thousands of adults and stole their children. Some detainees gave birth in a room of the torture center in the officers’ residence at the Escuela Superior de Mecánica de la Armada in Buenos Aires, where detainees were interrogated and most of them executed, with hundreds of their children raised by pro-dictatorship families. Camps have often emerged at moments of crisis or in response to a social challenge, when societies are vulnerable to fear or division. Just as detention of children was meant to wear down Boer guerrillas resisting imperial rule a century ago, the detention of children today is meant to deter parents from seeking asylum at the U.S.-Mexico border. These shelters may seem like a temporary solution, but irregular detention tends to persist and warp over time. The torture and extrajudicial detention that began at Guantanamo, Cuba, during America’s 21st-century “War on Terror” had roots in the treatment of Haitian asylum-seekers who were intercepted at sea and imprisoned on the base in the 1990s. HIV-positive detainees were segregated and held in such grotesque conditions (without access to adequate medical or legal assistance) that U.S. courts intervened. 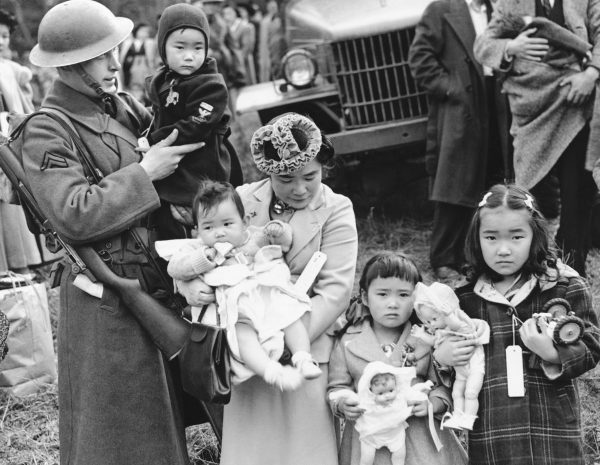 Mrs. Shigeho Kitamoto and her four children, along with other Japanese Americans, were forced from their homes on Bainbridge Island, Wash., to an inland internment site, March 30, 1942. Image courtesy of Associated Press. Concentration camps rose out of aggressive strategies intended for use in fighting guerrilla insurgencies. Today neither a war on the border nor even a civil conflict can serve as an excuse for this policy. Though there is plenty of military rhetoric, what we really have is a concentration camp policy wielded against refugees, which has devolved into a war on children. The American Academy of Pediatrics has already announced that the policy of separation alone is enough to do significant harm to children. This shift in policy has been sprung on a complex, already overburdened asylum and immigration system with a history of abuse. 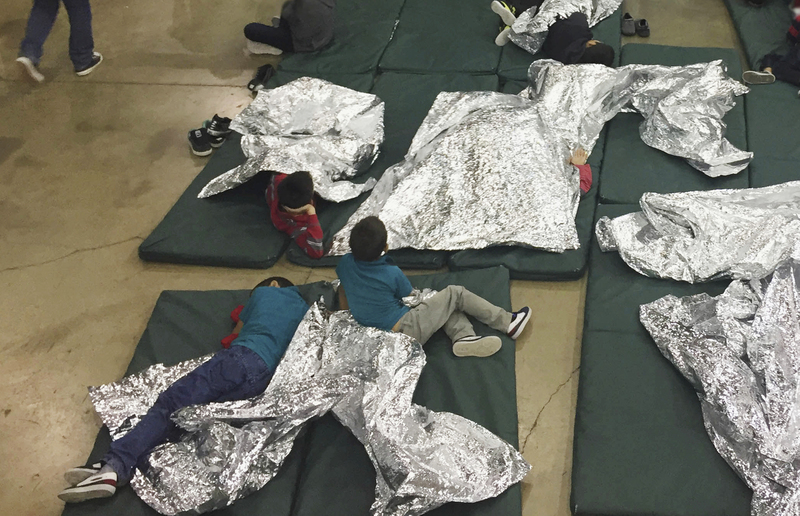 Under the best of leadership, the surge in children detained would mean overcrowding, sanitation problems, and physical and mental health issues. We do not yet know how many children will be unable to reunite with family members as a result of bureaucratic mix-ups, language barriers, and other issues. And things are unlikely to get better without intervention that ends the policy of separation. History shows that problematic detention practices become normal, and then they get worse. We can already see the background demonization of refugee children in the pamphlet titled “Unaccompanied Alien Frequently Asked Questions” available through the U.S. Office of Refugee Resettlement. It reveals both how strongly fears of foreigners have taken root in the United States today, and how the process of locking up children is turning them into targets. The first three questions cover what impact shelters will have on the community, whether kids are carriers of infectious diseases, and whether they are involved with violent gangs. What is likely to come next? The historical parallels are already evident. As in the era of the Boer War, politicians are saying that detainees locked up by the government against their will are burdening American taxpayers. Asylum-seekers are blamed for bringing detention upon themselves, and more reprehensibly, on their children. There is no need to see how much history is willing to repeat itself before stopping the current experiment. Andrea Pitzer is an editor-at-large with Zócalo Public Square and the author of One Long Night: A Global History of Concentration Camps.